Brian McNaught has a special knack for enabling people to understand what it means to be gay. He has done so as a writer and lecturer since 1974, explaining, encouraging, and often healing his audiences. McNaught provides a look-- sometimes humorous, always insightful-- at such concerns as whether or not to "come out," maintaining ties with one's family, building love relationships that last, developing an honest relationship with God, dealing with AIDS, and accepting oneself as decent and worthy of respect. Brian McNaught is an award-winning writer, sexuality educator, and consultant on the issues facing gay, lesbian, and bisexual people. He has trained several thousand employees of AT&T and Bell Communications Research (Bellcore) on the topic of "Homophobia in the Workplace." Since 1974, Mr. McNaught has spoken at nearly one hundred universities and has produced numerous educational materials on homosexuality and on Acquired Immune Deficiency Syndrome (AIDS). From 1982 to 1984 he served as the Mayor of Boston's liaison to the gay and lesbian community. 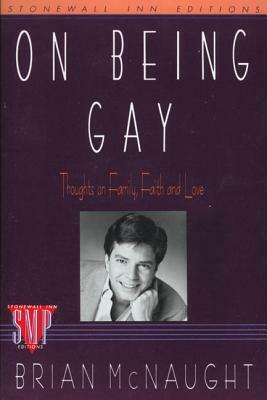 Mr. McNaught is the author of the popular book On Being Gay: Thoughts on Family, Faith, and Love. He received his degree in journalism from Marquette University in 1970. A native of Detroit, Mr. McNaught now resides in Atlanta, Georgia.